ActiveState (see coverage here), is today announcing the general availability of version 2 of Stackato, their private PaaS designed for enterprise customers. By way of introductions, over the 15 or so years it has existed, ActiveState have focused on understanding three things deeply; Developers, Enterprises and OpenSource technologies. I spent some time recently talking with CEO Bart Copeland and other members of the ActiveState exec team about their genesis and was told that the ascension of the cloud was watched with interest by the company, but it wasn’t till the advent of platform as a service, and in particular the release of OpenSource PaaS Cloud Foundry, that ActiveState found an opportunity that totally fitted their particular expertize. In justifying the existence of private PaaS, Copeland explained that while PaaS may be revolutionary, limiting it to public infrastructure strongly reduces its ability to break out and drive enterprises value. Enterprises certainly want the value that PaaS can bring, but want PaaS to be done differently for their needs. To this end Stackato delivers a private PaaS, that gives customers flexibility around the cloud stack they use and also their hypervisor of choice. In terms of this new release, Stackato now supports .NET applications, offers web-based visual cluster management, and delivers some performance improvements compared to previous versions. As far as polyglot language support goes, Stackato supports applications coded in development languages like Java, Ruby, Python, Perl, PHP, Node.JS, Clojure, Scala and Erlang. Deploying .NET applications to Stackato is achieved via technology integration with the Iron Foundry platform: Stackato’s automatic configuration tool links with Iron Foundry to support .NET apps in a Stackato PaaS cloud. Advanced containerization technology secures cloud apps, but also conserves scale and capacity, meaning the apps run better in less virtual real estate (with multiple containers per VM). The enhanced Web Management Console now offers visual cluster administration: DevOps gain greater visibility into cloud applications deployment management with less administrative impact, meaning their devs can spend time coding instead of writing reports. I believe that PaaS is the way of the future as it delivers higher levels of abstraction than does IaaS. That said, it’s also a fact that PaaS is a more difficult concept to articulate and hence uptake has been slower than one would have imagined. Part of the reason for this is that PaaS has more dependencies and complexities and hence is sometimes harder to shoehorn into an organization than simply using virtual servers. 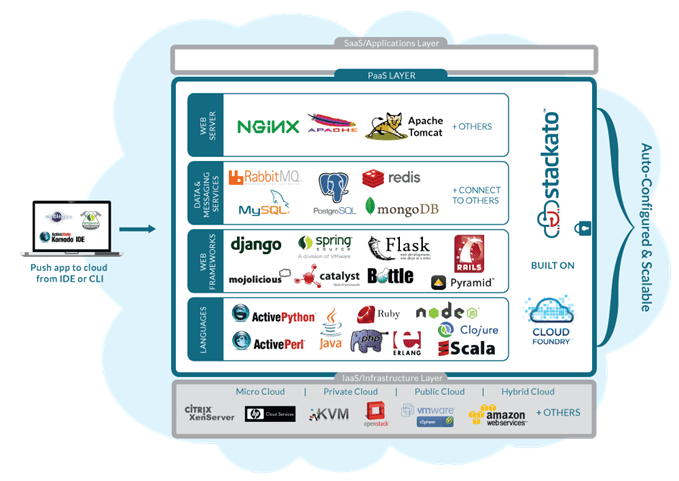 One of the ways that enterprises will start to use PaaS, and see the real benefits it can bring, is by vendors building as much flexibility into their applications as possible – this is where Stackato – as a PaaS that is deployable behind the firewall, supports all major cloud stacks, and is multi hypervisor and multi development language, comes in. Talking behind the scenes with organizations using PaaS, the value proposition that Stackato articulates is well appreciated and sufficiently flexible to actually jump on board with. The jury is still out however on what VMware’s longer term intentions are and many inside the community are quietly a little concerned that VMware will work hard to build an ecosystem, before crushing that ecosystem in order to meet their own objectives. It’s potentially because of this concern that I’m seeing a significant amount of partnering, even among competitors, in the Cloud Foundry ecosystem. The challenge for all these players is to build sufficient momentum behind PaaS generally, and Cloud Foundry more specifically, to protect themselves in the event of something untoward happening with VMware. Regardless of industry politics, the Stackato offering is compelling – at the recent DeployCon PaaS-focused conference we heard from Warner Music who are completely rebuilding their technology business on top of PaaS – the benefits they see in terms of agility, speed and reduce operational hassles are paying dividends. By providing enterprises with private PaaS for inside the organization, those benefits will be driven further.